SOUTH SUDAN – Lotum Longolio rejoiced as she gathered up her rations of sorghum (a grain used to make porridge), beans, cooking oil and salt at the food distribution centre. Lotum, 25, lives with her husband and three children. She is a jovial young woman despite being deaf and mute. As winter began to settle across Canada in December 2017, hunger persisted in South Sudan. 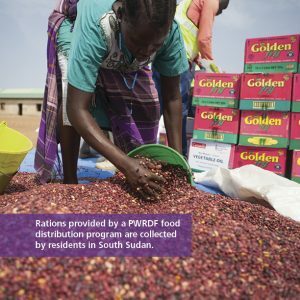 PWRDF led a food distribution project that fed thousands in a rural county in Eastern Equatoria State, through our equity in the Canadian Foodgrains Bank and a 4:1 match from Global Affairs Canada. The United Church of Canada also contributed $100,000 and Adventist Development and Relief Agency South Sudan was our partner on the ground distributing the food. “We are now responsible for making sure everything goes as planned, dealing with the suppliers, monitoring and evaluating,” said Naba Gurung, PWRDF’s Humanitarian Response Coordinator, who was in touch with ADRA South Sudan on a daily basis during the distribution process. Lotum and her family were among the 1,799 households (8,960 individuals) in seven districts of Kapoeta North County benefitting from the project. Lotum is thankful that ADRA South Sudan organized a house-to-house registration that makes sure people with disabilities are reached and included.